No matter which scientific field interests you, you’re bound to find a field guidebook to help you while on the trail. Want to learn about flowers? I can recommend ten titles for you. You can fill a bookshelf with just field guides on birds. However, when it comes to finding a good field guide on lichens, to help identify those colorful splashes of color and shape found in just about every corner of the globe, then your options are slim. Stephen Sharnoff decided to do something about it. For most of his adult life, Sharnoff has made his living as a carpenter and building contractor, doing remodeling jobs in and around Berkeley, California. However, in his free time, he became passionate in photography. Along with his late wife, Sylvia Duran Sharnoff, a well-respected photographer and naturalist, he started pointing his camera at lichen in the 1970s. 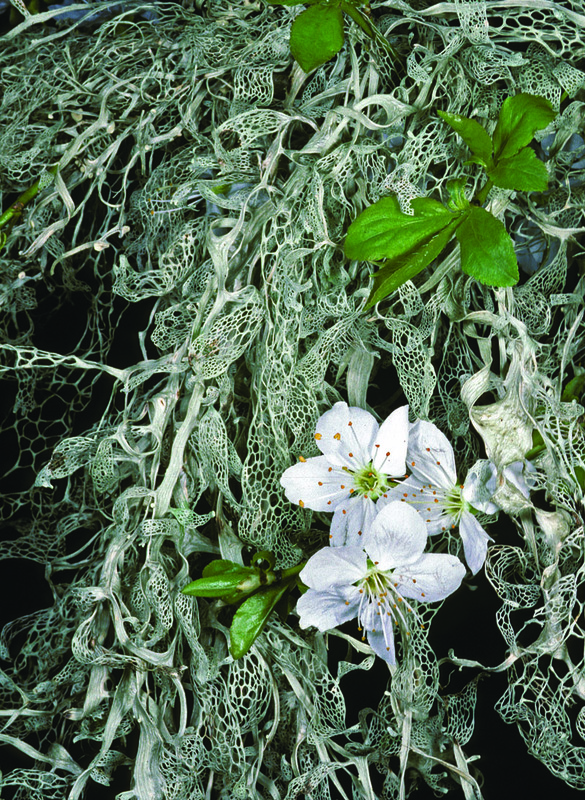 His talent of photographing the macro world of lichens has become recognized internationally. 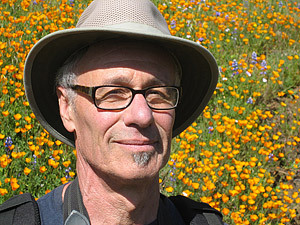 Dr. Brett Michler, Director of the University and Jepson Herbaria at UC Berkeley, believes he is “one of the top plant photographers of his generation.” You can find Sharnoff’s work in the pages of National Geographic Magazine, Lichens of North America, Macrolichens of the Pacific Northwest, and dozens of scientific and photographic publications. His most recent work is his first foray as both author and photographer: A Field Guide to California Lichens, the first guidebook on lichens of California in 25 years, was released just last week (May, 2014). I had the pleasure of interviewing Stephen by e-mail in the days leading up to the publication. Kolby Kirk: I would like to hear about the history of your relationship with lichenology. You’re a research associate at the Missouri Botanical Garden as well as at the University and Jepson Herbaria at the University of California, Berkeley. You are also an accomplished nature photographer who has contributed to some of the best publications of lichens in the United States. When discussing your work as a lichen photographer, which passion blossomed first: lichenology or photography? Stephen Sharnoff: I’ve always loved photography, but had only tried it a few times before I became involved with lichens. 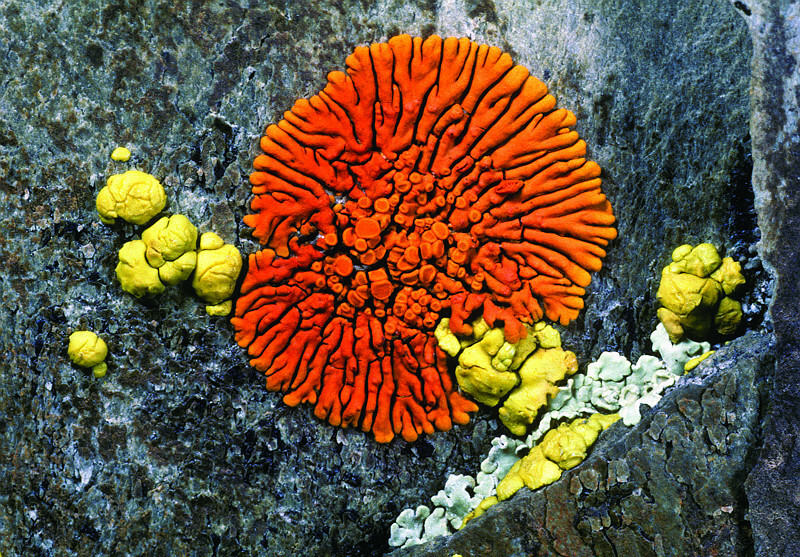 My late wife, Sylvia, decided to start taking pictures of lichens in 1973, and I soon shared her enthusiasm. Her father was an accomplished botanist and botanical photographer, and he began to study lichens late in life when he was already beginning to be affected by Alzheimer’s Disease so he never got far with it. Sylvia saw that lichens were actually very prominent in many landscapes, but that hardly anyone noticed them, and she thought they would make good photo subjects. We both began the long adventure with lichens then, leaving our two kids with their grandparents and going out on weekend trips to find good lichen spots. In the mid-1980’s we had an exhibit of lichen photos at the Oakland Museum, which later travelled to a number of other museums, including the Museum of Nature in Ottawa, where we met Dr. Irwin Brodo, one of the world’s most accomplished lichenologists. We travelled with him to the Queen Charlotte Islands, and on that trip decided to collaborate on producing a big guide to North American lichens. We had to raise some funding to support the multi-year field work this was going to require, and the Missouri Botanical Garden agreed to sponsor us; that’s how we came to be Research Associates there. After Lichens of North America was in press, we decided to start work on a field guide to the plants of the Sierra Nevada, and the University and Jepson Herbaria at the University of California, Berkeley became our sponsors for that fieldwork. A big part of doing these projects is that you have to collect “voucher” specimens for all the things you photograph, so you need ties to institutions that will receive and curate the specimens. Without the specimens, and someone qualified to examine them, it’s impossible to put accurate names on the organisms in the photos. 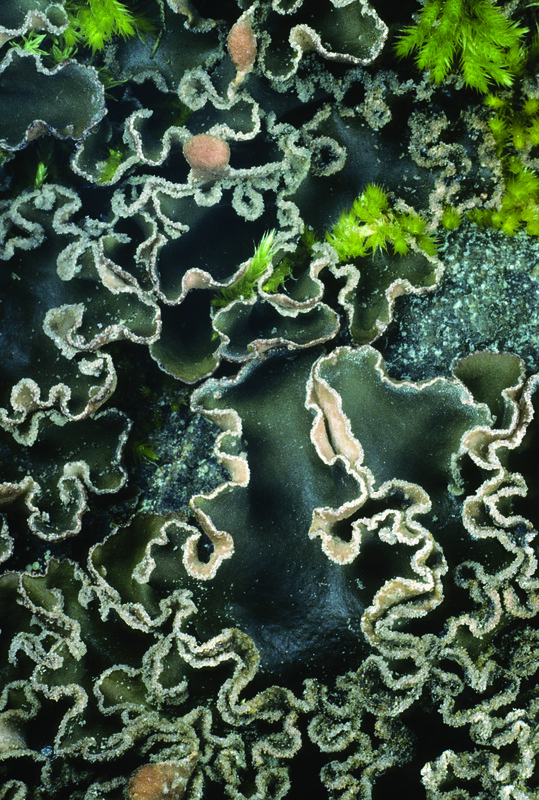 KK: I’m fascinated by the strange landscapes and shapes that a colony of lichens can create. It seems we have so much more to learn about lichens. What do you find intriguing about lichens? SS: There are a lot of strange and interesting things about lichens, starting with their forms and colors. The shapes are sort of plant-like but different, with a huge number of forms, and the colors can be subtle or amazingly bright, almost luminescent. 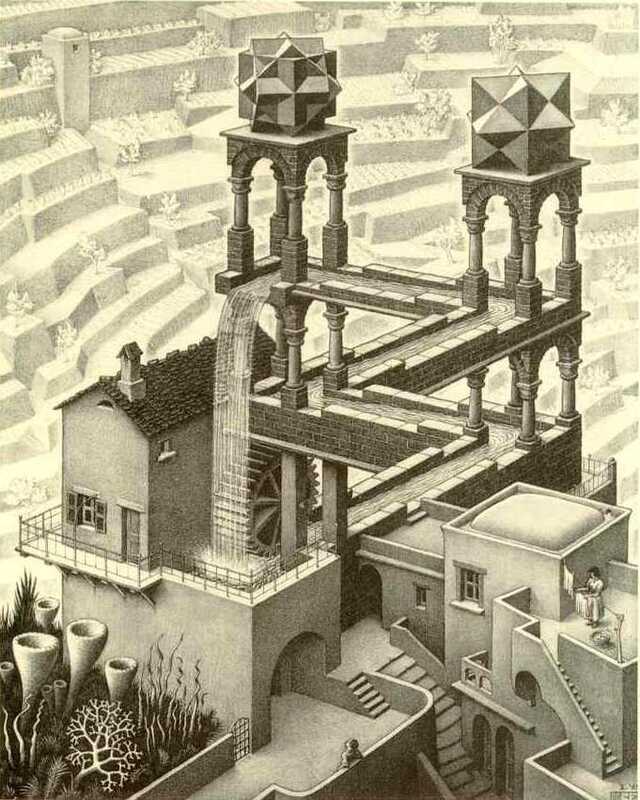 Some Escher drawings have lichens in them, as though to hint at their strangeness. The biology of lichens is intricate, being a relationship between two (sometimes three) different types of organism, fungi, algae, and sometimes cyanobacteria. Fungi, now in a kingdom of their own, may be more closely related to animals than to plants. Recent research shows that there are many species of bacteria in lichens whose role isn’t understood, each lichen making up a little ecosystem. And, as Irwin Brodo said in the Introduction to Lichens of North America, “lichens are the essence of wildness”. They can’t be cultivated or tamed, most of them need clean air to survive, and they grow in all the wildest and most beautiful places, old forests, mountaintops, remote deserts. KK: You made major contributions to Lichens of North America and Macrolichens of the Pacific Northwest. In what ways is A Field Guide to California Lichens different than these previous books? SS: A Field Guide to California Lichens attempts to do for California something of what Lichens of North America does for the continent, but in a size and format that you can carry in a day pack. It’s comparable to Macrolichens of the Pacific Northwest in size, but different in that it includes a lot of crustose species, those little dots and colorful powders on rocks and bark. There is an older field guide to lichens, Lichens of California (Hale & Cole, University of California Press, 1988), but it’s quite out of date and the illustrations aren’t very good. KK: What areas of the book are you excited to share with readers? SS: From the beginning, the idea of doing the photography was to get people excited about going out to discover lichens for themselves, to open them up to a world that was all around them but mostly unnoticed. For me, the primary fascination is still visual; I find lichens strange, beautiful, and infinitely varied, and they create much of the texture of what we see when we look at bark or rock. For example, the gray color of Sierra granite is mostly due to lichens. I feel both comforted and excited when I’m in a place with a good variety of lichens because I know it hasn’t been too altered, it still has a remnant of wildness. KK: Although you have attributed to a few books on lichenology, this appears to be your first solo-credit as an author. What lead you to strike out on your own? SS: Since I’m a photographer, not a scientist, I didn’t feel qualified to take responsibility for producing such a technical text, and I tried for many years to get someone else to write it. But no one could or would, and I was finally persuaded to do it myself. I’m glad I did! KK: Care to share an interesting anecdote to any of the photos? Any hard to find/photograph lichens that have a good back story? SS: One of the species in the book, the fertile form of Teloschistes flavicans, used to be considered a separate species, called Teloschistes exilis. It’s bright orange and branchy, with little orange disks, really striking, and the first time I ever saw it was on a dead twig on Mt. Tamalpais. Without thinking, I broke off the branch, and then realized I had taken all of the lichen from that location and felt like I had been too quick to collect, especially since it was a very long time before we saw any more of that species in California. It’s not common, and that became a lesson in how it’s often better to not disturb something wild and special. KK: If a reader would like to go out and search for lichens to see for themselves, where would they start? Are there certain times of year or certain places where they would have a better chance at seeing lichens, similar to how one would look for wild flowers? SS: Any place with a good variety of trees, bushes or rocks is a good place to look for lichens, but away from the city is best since most of them need clean air. Coastal locales are almost always good, and they often have a lichen flora that’s restricted to oceanic environments, in fact the California coast has “fog desert” lichens that are quite unusual. In the San Francisco area, you can see them on the rocks just north of Rodeo Beach in Marin County, but they grow on rocks from there all the way into Baja California. Inland mountains are also good. California’s Central Valley doesn’t have a lot of species because of air pollution and chemicals from agriculture, but one can see some bright orange Xanthoria species on the trees, because they like some of the agricultural chemistry. Lichens are not seasonal like mushrooms, in fact one could call them the “non-seasonal fungi”. But most kinds perk up when it rains, the colors brighten and get greener, and they become more noticeable. So the very best time to go looking for lichens is just after a rain. KK: What makes lichens worthy of our attention and protection? SS: As an old friend recently told me, “Beauty is its own excuse for being” and I totally believe this. Lichens also have important roles as food, nesting material and camouflage for a lot of animals. Hummingbirds disguise their nests with them, mule deer in California eat them, and reindeer couldn’t get through a winter without them. A lot of lichen species fix atmospheric nitrogen, so they contribute to soil fertility; in arid ecosystems this can pave the way for other organisms to grow. Where livestock haven’t destroyed them, soil crust lichens are a major factor in preventing erosion. They are such precise indicators of air quality that the Forest Service uses them to map air pollution across the state. SS: Most lichens are small, and the area I photograph is often about the size of a quarter. The biggest challenge with getting good pictures in this “macro” size is that when you focus so closely the depth of field (the front-to-back zone where things look reasonably sharp) becomes very shallow. To get more of the subject in focus one needs to use a very small aperature, typically about f.32, but then it’s hard to get enough light on the subject to get a picture. So I almost always use flashes, one on either side of the lens. A single flash creates harsh shadows, but with two of them you can get a nice balanced light. We used to use custom-made brackets to hold the flashes that allowed us to position each one where we needed. Currently, for close-ups, I use a Nikon D7100 with a 60mm macro lens and the RC1 system that attaches a pair of small wireless flashes to the front of the lens. If I’m taking photos of things that move, such as insects, I use the Nikkor 200 macro lens for longer working distance. We used to take slides, mostly Kodachrome, but starting in 2005 I switched to digital cameras. KK: Your website (sharnoffphotos.com) is a wealth of information for those wanting to learn about lichens, with over 9,000 images (nearly 80% being of lichens). What lead to the creation of your website and sharing so many beautiful photographs of lichens? SS: I feel that the photos should be available, not just the ones that end up in books but all the ones that are decent illustrations. The website is a good venue to display more pictures than any book can hold, and also to show a wider range of my work than lichens. I recently consolidated my website so that it includes the content of lichen.com (created by Sylvia and myself in 1997). Lichen.com still exists but is hosted by someone in Scotland, although for the present he is keeping the content as it was. KK: Do you have a favorite lichen or lichen photo in A Field Guide to California Lichens? 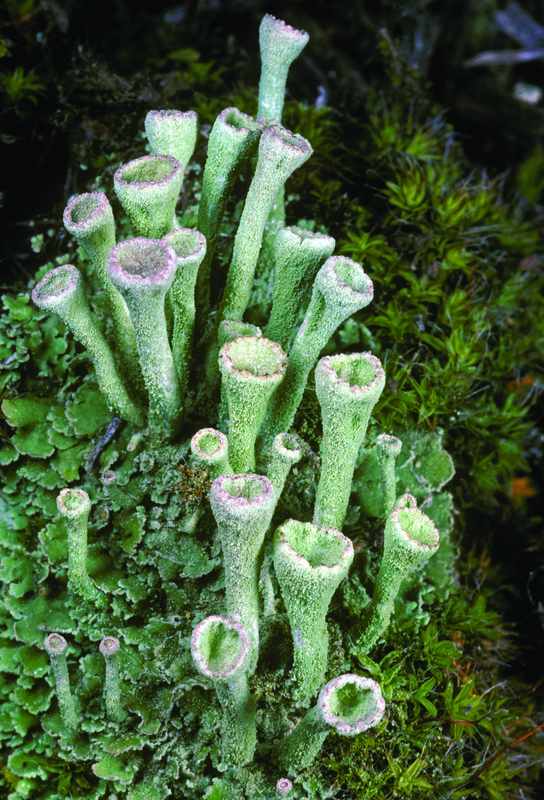 SS: Cladonia fimbriata (see photo below) is probably my favorite in the book, and I’m partial to that whole genus. The shapes are amazing, like a little world. KK: Your late wife, Sylvia Duran Sharnoff, was a well-respected photographer and naturalist. Her work with the North American Lichen Project has considerably helped promote and educate lichenology. How do you think she would see how far lichenology has come in the last 15 years? SS: She would be thrilled to see how many more species have been named, and how the public has become much more aware of lichens. She was really a pioneer in combining art with science in bringing lichens to the public’s attention. Is there anything that I haven’t covered that you would like to discuss? I’d like to mention that since 1997 I’ve been working on a new field guide to the wildflowers and flowering shrubs of the Sierra Nevada. Actually, this was Sylvia’s last inspiration for a project; when Lichens of North America was in press, and she was ill with an incurable cancer, she decided to start a big new adventure, and it’s been my goal to complete it. Over the years I’ve worked with several botanists on it, and now I’m fortunate to be collaborating with Joanna Clines, Forest Botanist for Sierra National Forest. The book will cover the whole range, foothills to alpine, and have photos and descriptions of about 750 species. I also self-published a photo essay about the cemeteries of Paris, available through Amazon. 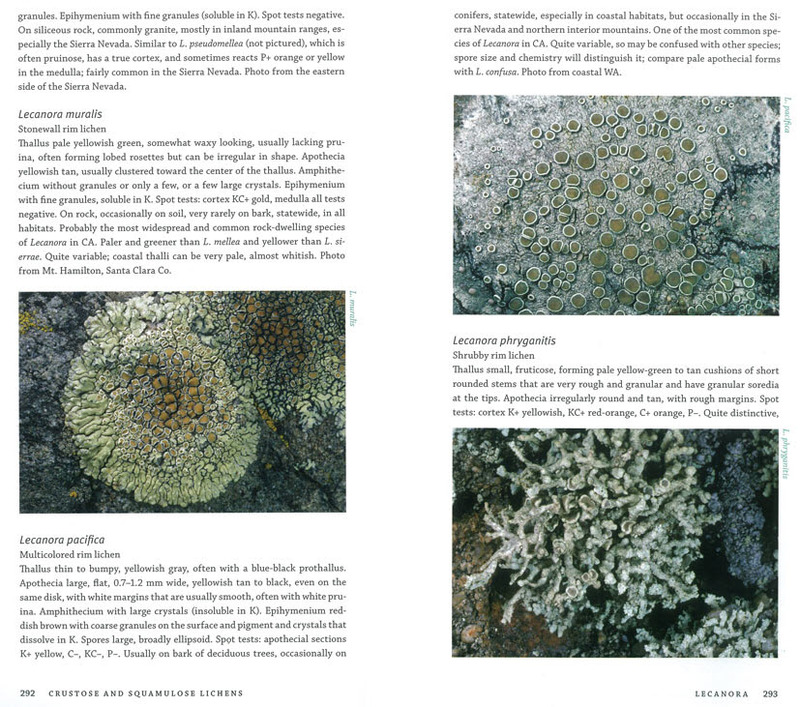 A Field Guide to California Lichens is available now. For more about Sharnoff and his work, you can visit Stephen Sharnoff Photography.